The son of Robert Darwin, a prominent English physician, Charles had an early interest in natural history, especially hunting, collecting, and geology. 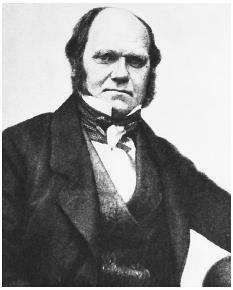 At his father's urging, Darwin attended medical school at Edinburgh, but found that he had little interest in medicine and returned home after two years. Wanting his son to have a respectable career, Darwin's father suggested that he should become an Anglican clergyman. Because the quiet, scholarly life of the clergyman appealed to him, Darwin agreed. He completed his degree at Cambridge in 1831. While awaiting an assignment, he was recommended for the job of naturalist on the survey ship Beagle, a voyage of nearly five years. In 1859 Darwin published The Origin of Species by Means of Natural Selection based on his discoveries during this voyage. This seminal work contained three major discoveries. First, it presented an overwhelming amount of physical evidence of Darwin's evolutionary thesis. Naturalists had observed evolutionary change since the time of the ancient Greeks, and by the mid-1800s the idea of evolution was "in the air." But it was not until Darwin published Origin that a body of empirical evidence supported the idea of evolution. Because of Darwin's thorough and compelling work, almost no biologists today doubt the reality of evolution. Second, Darwin discovered descent from common ancestry, demonstrating that all living things are related. Tracing the lineage of any two species back far enough, one can find a common ancestor. The modern fossil record and biochemical comparisons among species verify this observation. Earlier theorists such as Jean Baptiste de Lamarck had assumed that life had originated many times and that each lineage was unique and unrelated to all others. Third, Darwin discovered and described the basic mechanism by which evolution works: natural selection. Natural selection is the differential reproductive success of some individuals in a population relative to that of others. Modern biologists recognize other evolutionary processes not known to Darwin, but natural selection remains the basic mechanism. considerable variation in human height, skin color, and so on, within a population. Second, organisms are genetically programmed to reproduce. Reproduction is a very powerful biological urge, and animals will risk or even sacrifice their lives to accomplish it. Humans feel this genetic programming in several ways, as a ticking "biological clock," as parental instinct, or as an attraction to children. As a result, natural populations have a tendency to overpopulate. Biologists define "overpopulation" in terms of limiting factors that may include food, space, mates, light, and minerals. For example, if there is enough space on an island for 1,000 deer but only enough food to sustain a population of 100, then 101 deer constitutes overpopulation. The result of overpopulation is competition among the individuals of the population for the limited resources. If there are no limited resources, there is no competition. Competition results in "survival of the fittest," an unfortunate phrase that Darwin borrowed from contemporary social theorists who are now known as "social Darwinists." In Darwinian terms, however, fitness refers only to reproductive success, not to strength, size, or (in humans) economic status. Third, some of the variants in the population are more efficient than others in exploiting the limited resources. Success in obtaining limited resources is due largely to inherited phenotype. These individuals channel more of the limited resource through themselves and are therefore able to reproduce more successfully than individuals that compete less successfully. Thus, these selected variants pass on their genes for their genotype with greater frequency than do other variants. Fourth, the result of this selectively favored breeding is a modification of population gene frequencies over time that may cause a change in phenotype. That is, the average state of a given character undergoing selection changes from one generation to the next. If, for example, predators feed on slower antelope, the average running speed of the population will gradually increase from generation to generation. This is observed as evolution. And lastly, the losers, those individuals less successful at exploiting limited resources and at reproduction, may die in greater numbers (if, for example, they do not find enough food) or may find an alternative to the limited resource. Galapagos finches (Darwin's finches) with thinner beaks that were less successful at eating heavy seeds often found alternative foods such as insect larvae, which are more accessible to thinner beaks. Over time, this process results in evolutionary diversification of an ancestral species into two or more progeny species, the divergence from common ancestry recognized by Darwin. Darwin had three great accomplishments with the publication of Origin of Species in 1859. He produced an overwhelming body of physical evidence that demonstrated the fact of evolution. Darwin also discovered descent from common ancestry and, lastly, the basic mechanism by which evolution operates—natural selection based on differential reproductive rates of individuals in a breeding population. The implications of Darwin's discoveries have profoundly influenced almost every area of knowledge from science to religion to social theory. Bowlby, John. Charles Darwin, A New Life. New York: W.W. Norton and Company, 1990. Darwin, Charles. "The Origin of Species by Means of Natural Selection." In Mortimer J. Adler ed., Great Books of the Western World, second edition. Chicago: Encyclopaedia Britannica, 1990. Lack, David. Darwin's Finches: An Essay on the General Biological Theory of Evolution. Gloucester, MA: Peter Smith, 1968. Skelton, Peter, ed. Evolution: A Biological and Paleontological Approach. Harlow, England: Addison-Wesley, 1993.